Travel Service, the Czech airline company that operates scheduled flights under the SmartWings brand, has finalized an order for five Boeing 737 8 MAX airplanes, valued at $550 million at current list prices. Travel Service previously placed an order for three 737 MAXs at the Paris Air Show in 2013 and currently operates a mixed fleet that includes 32 Boeing 737s. Travel Service is the largest Czech airline company, operating regular flights under the SmartWings brand, charter flights and private flights in the Business Jet category. Travel Service planes are flying to more than 300 airports on 4 continents. Travel Service is present on market not only in the Czech Republic but also in Slovakia, Poland and Hungary, where the company has its subsidiary companies. This entry was posted in SmartWings, Travel Service Airlines and tagged Boeing, Boeing 737 MAX 8, SmartWings, Travel Service Airlines on January 5, 2017 by Bruce Drum. 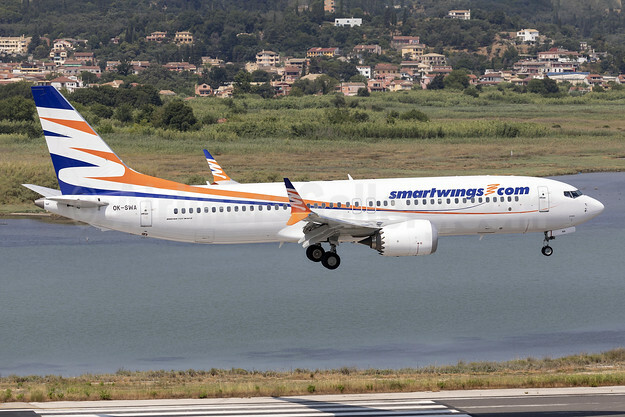 SmartWings (brand of Travel Service Airlines) (Prague) is adding three new holiday routes from Bratislava starting in June: Olbia (June 14), Palma de Mallorca (June 13) and Rhodes (June 9) per Airline Route. In addition, the carrier will also start seasonal service to London (Gatwick) from Prague from April 2. The route will be operated four days a week with Boeing 737-800s. Copyright Photo: Rolf Wallner/AirlinersGallery.com. Boeing 737-8S3 OK-TSA (msn 29250) taxies at Zurich. This entry was posted in SmartWings and tagged 29250, 737, 737-800, 737-8S3, Boeing, Boeing 737, Boeing 737-800, bratislava, Gatwick, OK-TSA, Palma de Mallorca, Prague, SmartWings, Travel Service Airlines, ZRH, Zurich on January 12, 2015 by Bruce Drum. 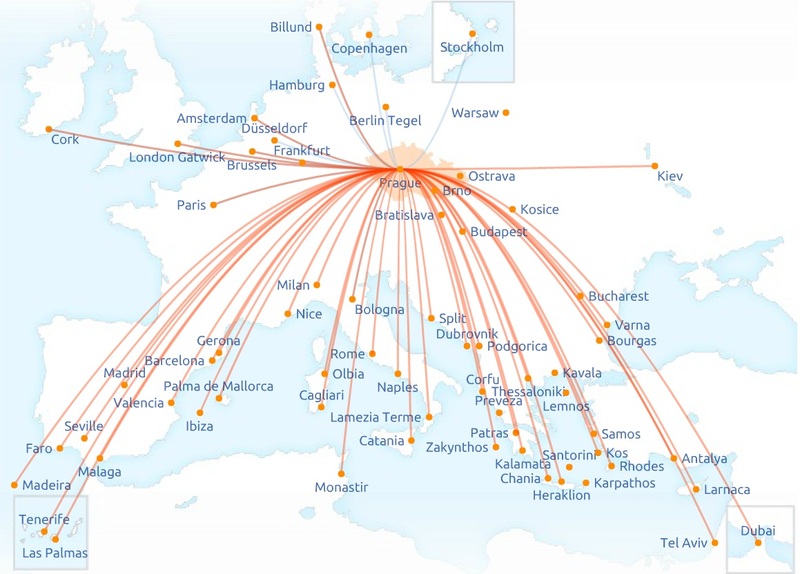 SmartWings (smartwing.com) (Prague) is adding more routes and flights from Warsaw, Poland. Warsaw-Lanzarote was added yesterday (November 1) following by the Warsaw-Fuerteventura route tomorrow (November 3). Warsaw-Las Palmas will be added on November 4 and Warsaw-Tenerife Sur (South) on November 6 per Airline Route. 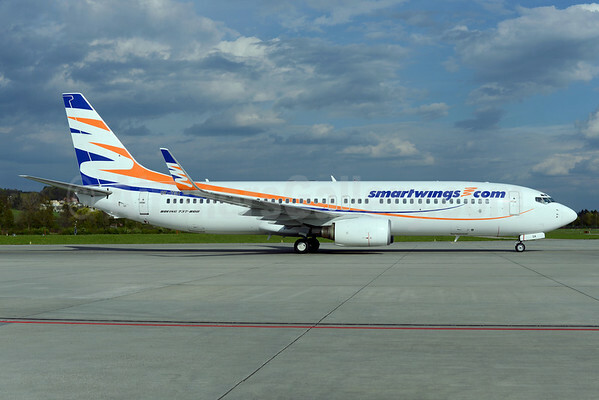 SmartWings is a brand name of Travel Service, a.s. (Travel Service Airlines) with regular flights from its base at Prague Airport. 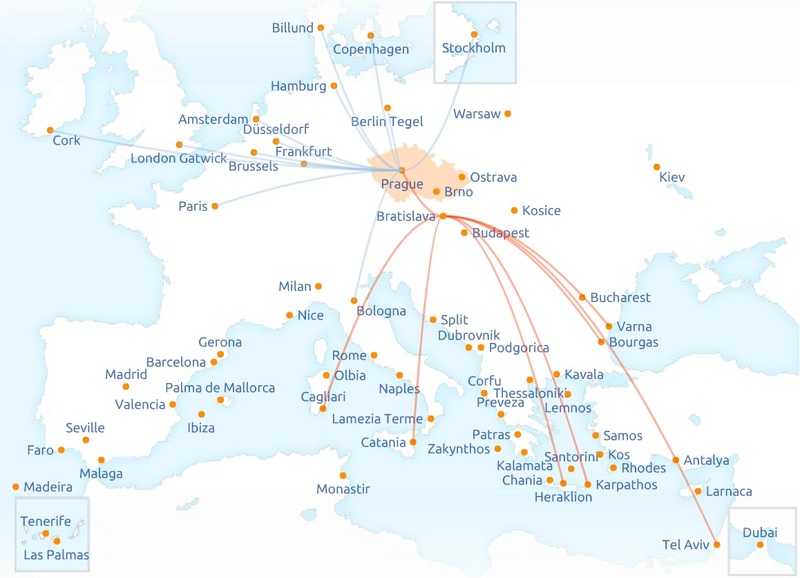 During the year, SmartWings offers flights to more than forty popular destinations and resorts throughout and outside Europe with departures from Prague, Brno and Ostrava. Every summer season SmartWings brings flights to new destinations as well an increase of frequencies to the current ones. Travel Service, a.s., the largest airline in the Czech Republic, has been operating in the market for 15 years. Travel Service, a.s. is the leader of the charter market in the Czech Republic, Slovakia, Hungary and it has a noticeable share in Poland. Apart from charter flights, Travel Service has also been conducting regular lines under the brand SmartWings since 2004 and since 2007 with private charter flights. 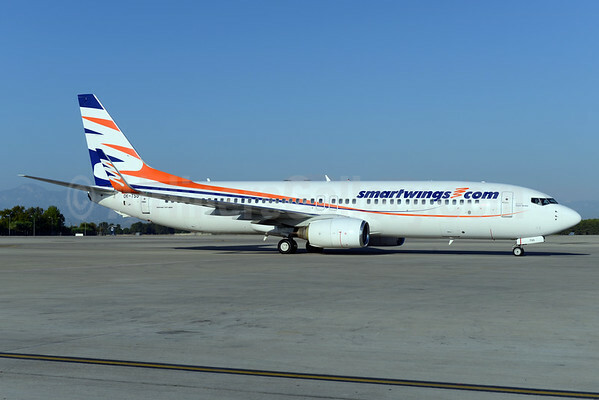 SmartWings operates Airbus A320s, Boeing 737-700s and 737-800s. Copyright Photo: Ton Jochems/AirlinersGallery.com. Boeing 737-82R OK-TSG (msn 30666) taxies at Antalya, Turkey. This entry was posted in Uncategorized and tagged 30666, 737, 737-800, 737-82R, Antalya, AYT, Boeing, Boeing 737, Boeing 737-800, Fuerteventura, Lanzarote, Las Palmas, OK-TSG, SmartWings, Tenerife Sur, Travel Service, Travel Service Airlines, Warsaw on November 2, 2014 by Bruce Drum. Czech Airlines-CSA (Prague) and partner Korean Air (Seoul) have announced Korean Air has exercised its option and brought in another equity partner. 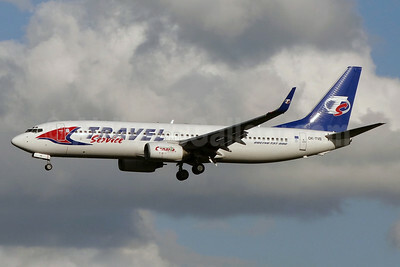 Travel Service Airlines (Prague) is acquiring a 34 percent share in Czech Airlines. Korean Air retains its 44 percent share. Czech Aeroholding has been informed by Korean Air about its requirement to use option to exercise its right to purchase further 34% of Czech Airline stock from Czech Aeroholding. This step is in accordance with the purchase contract on the sale of 44% of Czech Airline stock signed by Korean Air and Czech Aeroholding in April this year. Korean Air will subsequently sell 34% stake to Travel Service, an air carrier, which will thus become a co-shareholder of Czech Airlines thus joining Korean Air which holds 44% of shares, Czech Aeroholding with the final share of 19.74% and Ceska Pojistovna which will continue to hold its 2.26% share in Czech Airlines. Korean Air explains the decision to exercise its option on further 34% of the Czech Airlines shares which is to be subsequently sold to Travel Service by its plan to reinforce its operations in Europe. Working together with Travel Service, the company wishes to make Vaclav Havel Airport Prague its European hub. The entry of Travel Service into Czech Airlines will provide Korean Air with connections to approximately 40 new destinations in Europe to which their passengers will be able to fly after their transfer at Vaclav Havel Airport Prague. As early as in spring of this year, Korean Air purchased 44% of Czech Airlines shares from Czech Aeroholding which it will continue to hold. 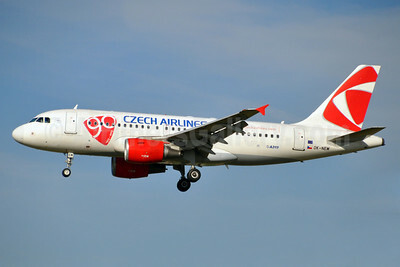 Now it wishes to use the Czech Airlines platform to collaborate with Travel Service. With regard to the fact that Travel Service, the new shareholder, is a Czech air carrier, Czech Airlines will not lose the status of the so called national carrier. “We regard the development of Vaclav Havel Airport Prague aiming to make it a Central-European hub as absolutely crucial. The fact that Korean Air is bringing another key partner into Czech Airlines represents a step toward fulfilling this aim. I am convinced this partnership will be advantageous particularly for passengers who, in future, will be able to choose from a more quality product – a wide network of destinations – provided by the three carriers,” said Miroslav Dvorak, chairman of the Board of Directors and CEO of Czech Aeroholding. In spite of the fact that the contractual documentation might be signed as promptly as possible, it will surely include suspensory conditions. This is because the entire transaction is first subject to approval by the competent antitrust authorities, which may take several months before it can take effect. In the context of changes of the Czech Airlines shareholder structure, Philippe Moreels, the current President and Chairman of the Board, announced its intention to resign from both positions. “I welcome the entry of Travel Service into Czech Airlines and also perceive it as the culmination of the company’s intensive four year restructuring period. In this new phase, Czech Airlines is going to need some new blood and a change in its management style. Therefore, it is logical that all the shareholders will agree on a new company president after the transaction has been completed. Until then, I will continue to be available and will be working on all the steps necessary allowing the transaction to bring a synergy effect to allthe partners as soon as possible,” said Philippe Moreels about his intention to resign from both his positions after the transaction has been approved by antitrust authorities. After the transaction has been approved by antitrust authorities, the Czech Airlines statutory bodies will continue to consist of three members and their composition will reflect the new shareholder structure of the company. Top Copyright Photo: Karl Cornil/AirlinersGallery.com. Airbus A319-112 OK-NEM (msn 3406) of Czech Airlines arrives in Amsterdam with the special 90 Years (1923-2013) logo. Bottom Copyright Photo: Paul Bannwarth/AirlinersGallery.com. 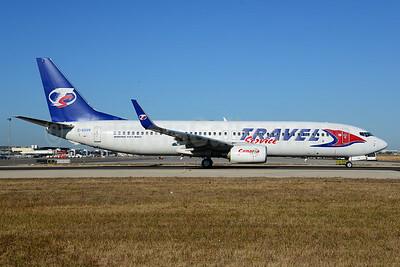 Travel Service Airlines’ (Czech Republic) Boeing 737-8CX OK-TVB (msn 32362) prepares to land in Nantes, France. This entry was posted in Czech Airlines-CSA, Korean Air, Travel Service Airlines and tagged 32362, 3406, 737, 737-800, 737-8CX, A319, A319100, A319112, Airbus, Airbus A319, Airbus A319100, AMS, Amsterdam, Boeing, Boeing 737, Boeing 737-800, CSA, Czech Airlines, Korean Air, Nantes, NTE, OK-TVB, OKNEM, Travel Service Airlines, Travel Service Airlines Czech Republic on December 10, 2013 by Bruce Drum. Boeing (Chicago) and Travel Service Airlines (Prague) have finalized an order for three 737 MAX 8s, valued at $301.5 million at list prices. The Czech Republic-based carrier originally announced a commitment to purchase the 737 MAX in June during the 2013 Paris Air Show. This announcement brings the total number of orders to date for the 737 MAX to 1,498 airplanes. Copyright Photo: Ton Jochems/AirlinersGallery.com. Travel Service Airlines’ Boeing 737-8Q8 C-GVVH (msn 35275) at Palma de Mallorca this summer still wears the registration used by Sunwing Airlines during the winter. Normally the airliner wears OK-TVH with Travel Service. The new 737 MAX 8s will expand the Boeing fleet. This entry was posted in Travel Service Airlines and tagged 36275, 737, 737800, 7378Q8, Boeing, Boeing 737, Boeing 737800, CGVVH, Palma de Mallorca, PMI, Travel Service Airlines, Travel Service Airlines Czech Republic on August 7, 2013 by Bruce Drum. Oman Air (Muscat) and Boeing (Chicago) today announced an order for five Boeing Next-Generation 737-900 ER airplanes at the 2013 Paris Air Show. The order, previously unidentified on the Boeing Orders and Deliveries website, is valued at $473 million at current list prices. With this order, Oman Air becomes the first customer in the Arabian Gulf region to order 737-900 ERs. Currently, the airline operates a fleet of 15 Boeing Next-Generation 737-800s and two 737-700s. With this new order, the airline now has a backlog of six 737-800s and five 737-900 ERs. In addition, Oman Air has six Boeing 787-8s on order. Copyright Photo: Paul Denton/AirlinersGallery.com. 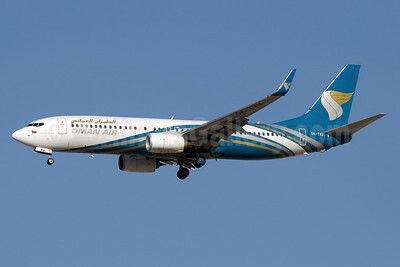 Operated by Travel Service Airlines in full Oman Air colors, Boeing 737-86N OK-TVU (msn 38025) prepares to land at Dubai. This entry was posted in Travel Service Airlines and tagged 38025, 737, 737800, 73786N, aviation, Boeing, Boeing 737, Boeing 737800, Dubai, DXB, OKTVU, Oman Air, transportation, Travel Service, Travel Service Airlines on June 19, 2013 by Bruce Drum.